DetailXPerts is the first detailing business to use steam to clean vehicles. As such, it provides franchise opportunities to everyone who wants to start their own successful business. A business with great care for details, excellence in quality, and environmental protection. A business that brings its owner wonderful franchisee advantages. One of our best franchisee advantages is our flexibility. As a franchisee you are able to choose how big or small of an operation you desire. The original franchise fee entitles you to acquire up to five units. In turn, this allows you to expand your detailing business to the capacity you want. This ability offers you control over your income potential, your time, and your lifestyle. We provide a low-entry opportunity. It offers no overhead and low capital purchases. Additionally, your car wash franchise includes an equipment package. And you operate the detailing business from sites such as parking garages, country clubs, hotels, and casinos. In other words, places that are searching to offer auxiliary services to their patrons. They are eager to have you on their premises. Wouldn’t this be one of the top franchisee advantages you are looking for? You do not need to have previous experience in the car wash, detailing business, or automobile industry. Actually, we prefer it if you do not. We have a unique process and success depends on how well you follow it. Our team will train both you and your employees in the technical aspects of the detailing business. We also provide the training you need to operate and grow your business successfully. Supporting and providing excellent service to our franchisees is one of our main missions. We are the first eco-friendly steam cleaning vehicle wash and detailing franchise in the world. This sets us aside from all other similar service providers. Parking garage owners and managers seek our presence on their premises. We do not need water to operate nor do we dump chemicals and detergents in the environment. They provide us with a ready and eager clientele. We provide their customers with a superb professional detailing service and a professional image. Being the first is always an advantage. Our patent-pending process and years of research assure you a head start. We make a difference in the environment. We save water and use no chemicals and harsh detergents that pollute the earth or harm clients’ vehicles’ showroom finish. But, our mark does not stop there. We also make a difference in our communities. We offer jobs and training to non-skill workers. Thus, we create employment and opportunities for a critical portion of our society. Our employees are our partners and your employees will become yours. 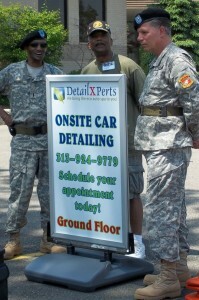 More information and details are available on DetailXPerts’ Official Franchise Website.